Legal pad with 30 imprinted perforated sheets, 5" x 8". 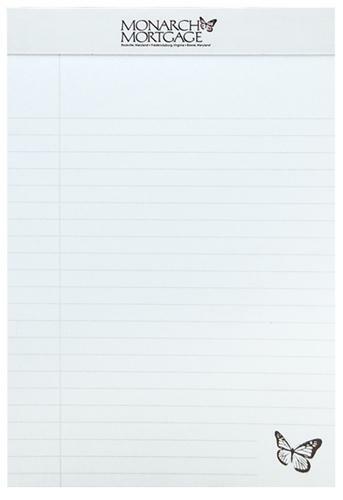 Legal pad with 30 imprinted sheets of 50 lb. white offset printed one standard color on one side. A basic desk accessory that serves the purpose of advertising your message simply and effectively. Sheets are perforated, and pad binding is stapled and covered with black tape (no imprint available). Exact PMS color matches not guaranteed on metallic headers. Perfect for portfolios. 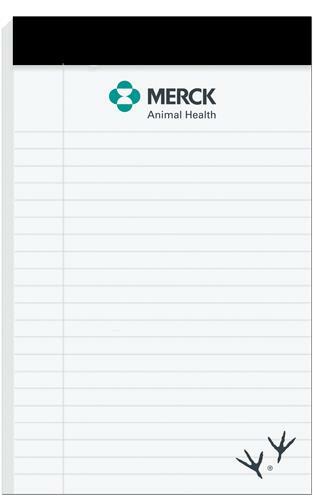 Imprint Area: 4 1/2" x 6 3/4"